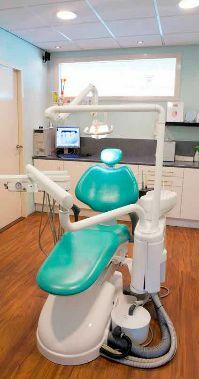 In our clinic, you can also bleach your teeth, this is done with a special silicone tray. First, the dentist takes an imprint of your teeth, with which the dental lab prepares a silicone tray exactly according to the form of your teeth. This is very important because only such a tray, can prevent leakage of the bleaching material and thus protect your gums. You take the tray home with you, that’s why this method is also called “home bleaching?. The dentist will instruct you how long you should use the tray with the bleaching gel, till you get the desirable result. Mostly it is recommended to use it over night and depends on the level of your discoloration, you will see the result after couple of days and up till two weeks. During the bleaching period you might suffer a bit from sensitive teeth and/or gums, in that case, please consult with the dentist. Alternative methods such as Laser or One Time treatments are not recommended as they damage the enamel of the tooth and cause severe sensitivity. Such treatments are followed by a relapse few days after the treatment has taken place, resulting in the teeth getting slightly darker again. Facing is a layer of dental composite material, or porcelain, cemented to the tooth. With facing, the appearance of a tooth can be improved. In that way the form or the color of a tooth can be changed, a gap between teeth can be closed, broken parts can be repaired, and misalignment of teeth can be masked. When the facing is made of composite, the whole treatment is done in one appointment. When the facing is made of porcelain, since it involves a dental lab, two appointments are required. Where it is needed, a thin layer of the surface of the tooth is removed to create space for the facing, otherwise the outline of the tooth will get bigger than the original one. Before placing the composite facing, the surface of the tooth is etched and a layer of bonding material is placed. The composite is placed in the right form and hardened with blue lamp. After polishing the treatment is done. First the dentist takes an X-Ray of the involved teeth. Then the outer layer of at least 0,5mm is being removed making space for the porcelain facing. An imprint of the teeth is being taken . This imprint will be used to make the facings by the dental lab. Before placing the facing the tooth surface is etched a bonding layer is applied. The facing can now be placed. A crown is a cap of porcelain or porcelain fused to metal (pfm) which is made to fit your prepared tooth exactly. The crown is bonded with cement to the tooth. When a tooth is decayed in a manner that cannot be treated by making a filling. When a tooth is broken as a result of an accident. For cosmetic reasons to correct aesthetic malformations. Maintenance of a crown or bridge is required daily. The edge of the crown, where it meets the tooth, is where plaque can easily form. Therefore brushing this area is important and also flossing between the teeth. A bridge is made to replace a missing element. A bridge consists of anchoring elements on existing teeth and “ dummy “ elements replacing the missing elements . all connected to each other. for improving the chewing process by having bigger occlusal surface (chewing surface) and spreading the force on more elements. When a space exist between elements, the neighboring elements can rotate in the direction of the open space. As well, the elements from the opposite jaw, when having no contact, continue erupting. Due to those movements, occlusal problems can be created as well as pockets in the gums and aesthetic deforms. All of this can be prevented by making a bridge or other solutions. Improving your smile and masking malformations, as overlapping/ twisted teeth instead of orthodontic treatment. In case of an accident ended with a broken or demolished tooth, it is very important to visit the dentist as soon as possible. When the tooth is available, it should be kept if possible in milk or water. It is important to see a dentist within 2 hours after the accident. Later than that, the detached tooth cannot be placed back. In practice the dentist will decide then, what can be done. A broken tooth can be reconstructed, sometimes, with a white filling (composite)and sometimes with a crown. This is a type of tooth which is made by the dental technician. The crown sits on the existing tooth, which has been prepared before. Caries and tooth decay are caused by in appropriate mouth hygiene in combination with other factors. The acid waste products of the bacteria in the plaque decalcify the tooth fabric. If this decalcification continues long enough caries are developed. After cleaning the cavity, base is being placed ( material that protects the nerve chamber) , and then the cavity is being etched. primer and bonding materials are placed, hardened by a special blue light (plasma lamp). As last the white filling material is placed and hardened. Depends on the size of the cavity, matrix is being used to create the right form of the filling. Tandartspraktijk Niv Dent has room for new patients .